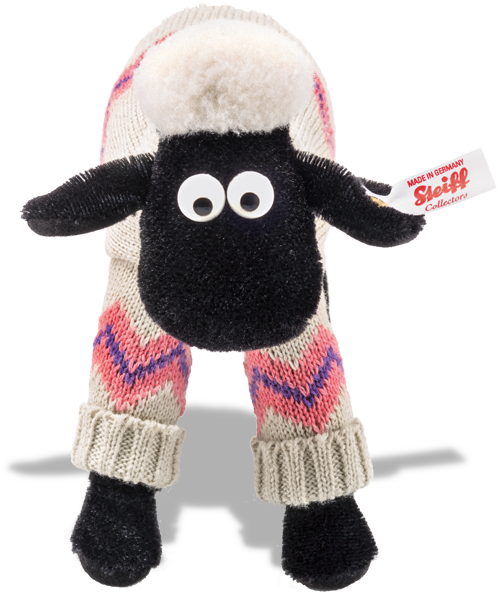 "From Aardman Animations 40th Anniversary"
Steiff SHAUN THE SHEEP is made from high quality white and black wool plush. He is 1-way jointed so you can move his head to look at you in different ways - and he is wearing a smart knitted outfit. SHAUN THE SHEEP, is a bright sheep who doesn't follow the flock. SHAUN and his friends are known for causing havoc and having hilarious adventures on 'Mossy Bottom Farm'. Despite causing havoc when he turns up at West Wallaby Street, Wallace becomes quite taken with this fleecy visitor. He's quickly utilised in Wallace's latest invention - the Knit-O-Matic - and comes out the other end squeaky clean but a little too closely shaved, hence the name 'SHAUN'! 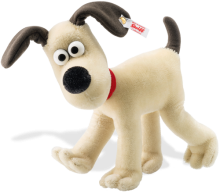 He might be small and rather mischievous at times, but SHAUN really comes into his own in a crisis - his quick thinking stops Preston's Mutton-O-Matic from turning Wallace, Gromit and a whole flock of sheep into dog meat! Join with us in celebrating Aardman Animations 40th Anniversary with this internationally famous, clever, confident, mischievous much-loved sheep and his award winning film. A Close Shave You'd be Baahmy not to join the fun! Limited edition of just 1,976 pieces. White label with famous Steiff gold plated button in the ear. REMEMBER you receive a free Steiff Gift Box (and it's own numbered certificate of authenticity), and Free delivery within the UK.